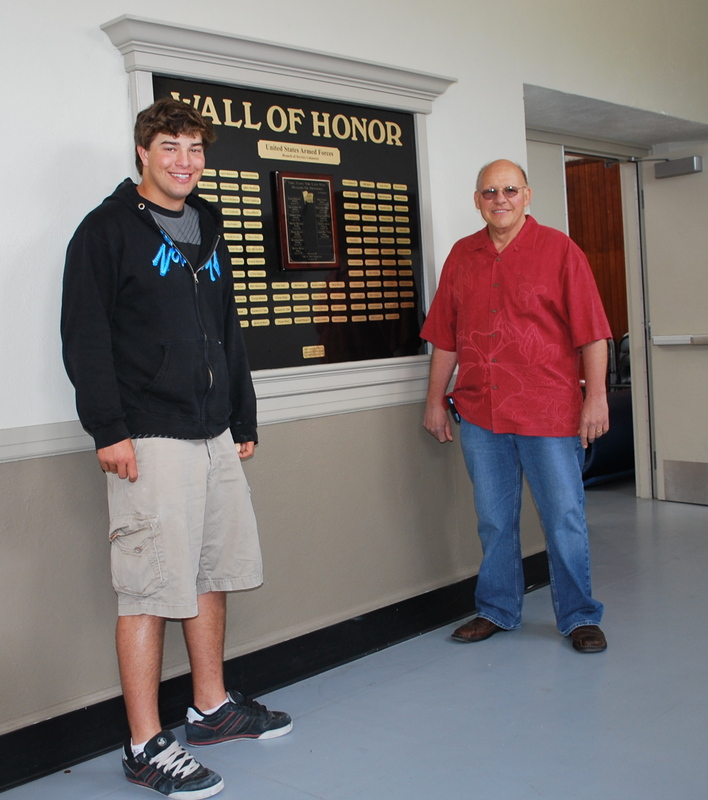 Crafted by Eagle Scout Nate Wilson, left, and conceived largely by high school math teacher Walt Hamera, the Wall of Honor in the high school’s North Gym (half of which is shown here) was dedicated in May 2009. The three were not to meet again in life. Just over a month later, Westgate became the first American mother in WWII to lose two sons when Gordon and Malcolm were killed at Pearl Harbor. Balfour was sent to the Philippines and became one of the casualties on a Japanese POW transport ship when it was torpedoed in 1944. Now, the Shive brothers and Balfour have been reunited along with other LBHS alumni, faculty and staff who have served, or are serving, in the armed forces, on a Wall of Honor that was dedicated to them last Saturday in the North Gym at Laguna Beach High School. It began when the school’s principal Don Austin realized the North Gym was missing a flag. He donated one that the U.S. Navy gave to his grandmother after his grandfather’s death during active duty in 1950. Hamera said English teacher Cathy Dunlap suggested framing the flag to preserve it. They took up a collection for the effort and the flag was framed and dedicated with a plaque last June. That’s when it occurred to Hamera, himself a veteran of the U.S. Marine Corps, to honor others connected with the school who had served. The idea seemed to catch on like wildfire, testament to a new popular sentiment emerging from the post-Vietnam era, when military service was often disparaged. Indeed, when Gary Shive, nephew of Gordon and Malcom, enlisted in the Army during his senior year at LBHS (1979), he told no classmates for fear of ridicule. “It wasn’t very popular to associate oneself with any of the military services,” he said. If appreciating those who serve their country went AWOL in the ‘70s, new recruits appear to be in charge today, who can express gratitude for service separate from political persuasion. Hamera began compiling a list of LBHS alumni, faculty and staff who had served in the armed forces. He turned to the LBHS Alumni Association. Its secretary and now its president, Howard Hills, received the board’s support to assist. The response was “pretty astonishing,” said Hills. Many responded not for themselves, but for family, friends and loved ones, to ensure they were not omitted. Gary Shive, for example, responded in order to make sure that his father and his uncles and Balfour were included on the list. He forwarded the image of the poignant postcard to Hills. The discovery that a page in the 1943 LBHS yearbook had a list of 110 students who had joined the armed forces between 1937 and 1943 was a big help. As part of her community service, LBHS senior Victoria French attempted to match names to the correct branch of the service, but found the U.S. military protective of such information. Her own grandfather, a veteran and member of the LBHS class of 1947, was of more help. Through him, she gained details on 12 names and a new appreciation for his service to the country. For Nate Wilson creating the Wall of Honor for his Eagle Scout project required dedicating nearly 70 hours to perfecting it. In addition to meticulous craftsmanship in constructing the wall frames, he took pains to match the wood, paint and style of the frame of an existing trophy case on either side of which the honor wall frames were to be installed. The harmonious exhibit on the wall just opposite the entrance to the North Gym is a testament to his success. Though Wilson already felt strongly about his project, his involvement gained a deeper level of meaning when he discovered shortly before the dedication ceremony that Weston Balfour, had been a member of his church, which has a record of his service. Similar coincidences popped up as the project gained momentum. When two men walked into the office where Hamera’s wife works and mentioned they were LBHS grads, she asked them if they had ever been in the armed forces. They had, and their names were added to the list. And just weeks before the ceremony, Hamera ran into a former student of his on the street. The young woman, once “a little pipsqueak” in his geometry class, was in uniform. She’s a second lieutenant in the Army; another name for the list. Both Hamera and Hills praised Austin for his support for the project and for his priority of keeping tradition alive at the school, which has a rich, 75-year history. Saturday morning arrived, and all the pieces simply fit together. Thurston eighth grader Karina Parker poignantly sang the national anthem a cappella. The ceremony was simple and heartfelt and had meaning for every one of the estimated 75 people in attendance.